Raiderthon, a 15-hour dance marathon and fundraiser, takes place Nov. 19 from 10 a.m. to 1 a.m. in the Apollo Room of the Student Union. The dance moves come once a year but the generosity, the cause and the joy never end. 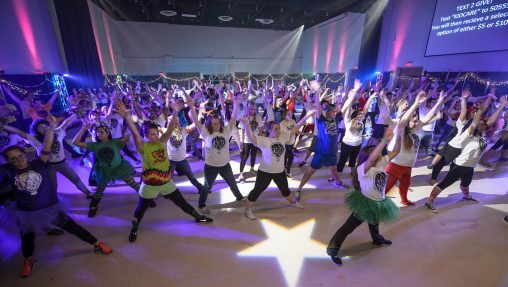 Wright State’s Raiderthon is a 15-hour dance marathon with a goal of raising $75,000 for Dayton Children’s Hospital. Raiderthon will be held Saturday, Nov. 19, from 10 a.m. to 1 a.m. on Sunday, Nov. 20, in the Apollo Room of the Student Union. The dance fundraiser occurs at more than 300 colleges nationwide to raise money for Children’s Miracle Network Hospitals. Last year, over 400 students registered for the event, said Bleser. He expects a larger number to register this year. During its three-year history, Raiderthon has raised more than $150,000 for Dayton Children’s Hospital. This year’s event will include a Raiderthon graduation ceremony to honor graduating students who have been involved in Raiderthon for its four years at Wright State. There will also be a magician from the local area and of course dancing. Register for Raiderthon at wsuraiderthon.kintera.org.